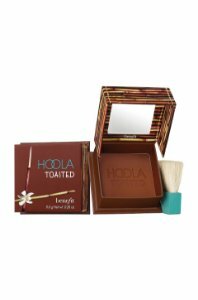 hoola matte bronzer travel size mini | 4.0 g Net wt. 0.14 oz. • hoola quickie contour stick fun size mini | 1.4 g Net wt. 0.05 oz. • watt's up! cream highlighter fun size mini | 2.5 g Net wt. 0.08 oz.